4 Aces Pipe Tobacco is a traditional and iconic brand that possesses a powerhouse lineup under its belt of a large assortment of flavors blended to perfection. 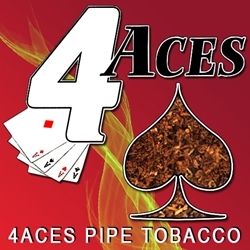 An ideal choice for smokers, 4 Aces Pipe Tobacco is a high quality tobacco created perfectly for those who enjoy a relaxing smoke made from this premium tobacco. 4 Aces pipe tobacco has developed a unique reputation for being a market leader in the pipe tobacco world. Each bag of 4 Aces is guaranteed to satisfy your smoking taste. 4 Aces Pipe Tobacco is distributed nationwide by Republic Tobacco Glenview, IL USA. 4 Aces Premium Tobacco is available at our online tobacco store in unique styles to choose from, Mellow, Mint, and Regular. If you’re looking for a great way to save money over expensive retail brands. Smokers Discounts offers you a great choice to buy 4 Aces tobacco online, it’s easy and affordable! Call us for more details!